"The entire costume is built from scratch using photo references and scans I took myself," CGS1 writes at The Dented Helmet. "The costume is built primarily out of sintra with pink insulation foam used to carve the helmet dome and a small amount of plastazote foam used on the tips and base of the jetpack rockets." Which jetpack, it bears mentioning, is removable – just like the one on the minifig. 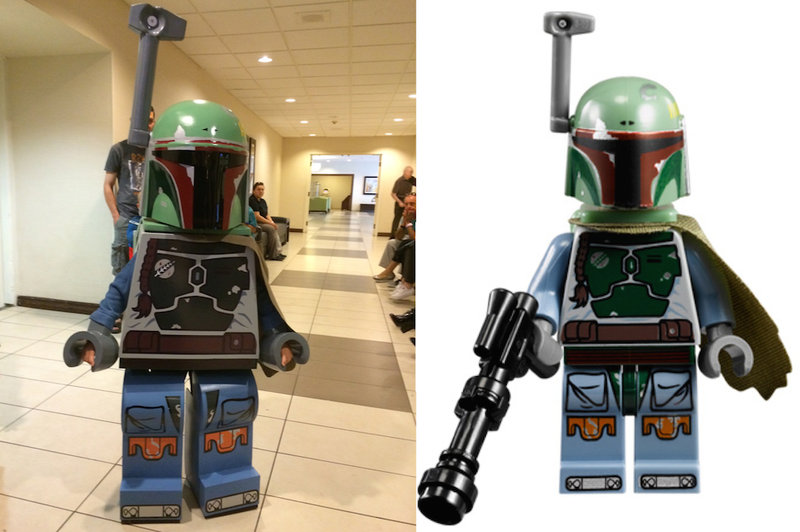 All elements of this costume were approached the same way - photos, measurements, 2D drawings, scale, proportions. I used Adobe illustrator to hash out linear drawings of the helmet. Once I had the correct size of the dome, I was able to start. After a couple failed attempts at creating the dome with plastazote foam (making wedges to form the dome) I decided to carve it the old fashion way and simply used pink insulation foam from Home depot. Once I completed the dome, I began building the helmet using the antenna mount as my anchor point. I used a heat gun to shape and form the sintra, and glued layers to create the details throughout the helmet. After a few revisions ( the dark green concave section wasn't deep enough and I had to redo it) the helmet was ready for bondo glazing putty. I use this to fill the seams and rough spots in order to achieve a seamless plastic molded look, much like a Lego minifigure. Excellent, excellent job. Many more details over at The Dented Helmet.